Are you ready to rejoice in the freedom He offers us? Are you ready to feel free from long to-do lists, insane expectations, and accomplishing everything there is to achieve? I warn you: this might require a priority or perspective shift. Being complete is about being full. You can’t be full if you have no parameters to fill. That whole “glass-half” question doesn’t work without a glass. Complete doesn’t mean perfect or finished. It isn’t determined by our schemes or dreams. Our “completion” is determined by our maker because He sets our capacity. He shaped our vessel. Purposefully, intentionally. And He fills it full. His to-do list for you is complete when you’ve crossed off just the parts the Lord asks for, just like Dana wrote about in her post about lists earlier this week. His expectations for you may not be as insane as your expectations for yourself are. He calls you to accomplish some things, according to His plans. You don’t have to go beyond that. Don’t worry about the size of your glass. Don’t chase after trophies with wider bowls. 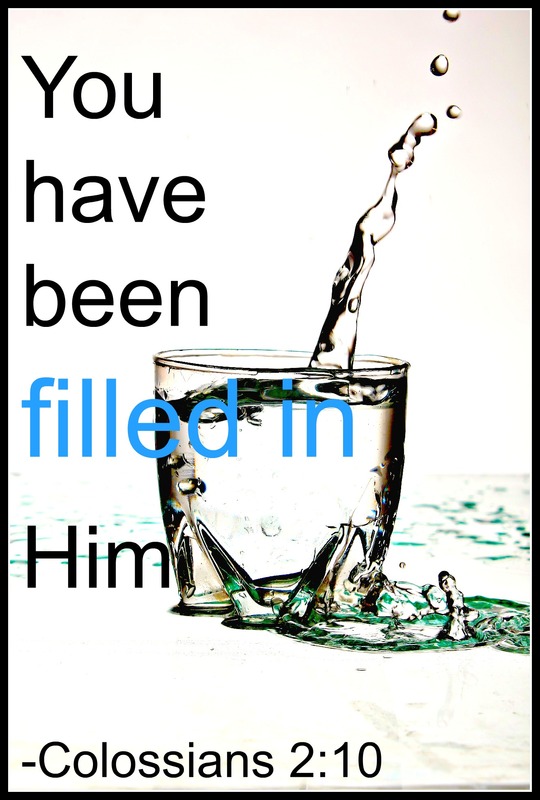 He has filled you full according to the capacities He has given you. Another way to phrase the definition is that what capacities He has given you He has met. To the extent that you need, He has fulfilled, if not exceeded. You, today, being in the hands of the one shaping, pouring out, and filling up again, are complete. Because He is filling you so perfectly, there is nothing missing, not a single drop, that you really need. It’s so hard to get our minds around that idea! Most of us tend to feel like we need to do just a little bit more! Thanks for a great reminder. Great encouragement here to remember that He has given us all we need. We really are complete in Him. Thank you for this reminder and thanks for sharing with us at #LMMLinkup. Blessings!